This example is in sound condition throughout and has recently been serviced. Cosmetically it is unrestored, with the remains of old nickel (fork crown, hubs and pedal cranks), period bell, and matching rat trap pedals. The saddle is in good usable condition and the previous owner fitted new tubes and white tyres. I’m not sure of its exact age. It has ‘blind’ front fork ends (i.e. the front hub does not slide out from an open end), which is a feature of turn-of-the-century bicycles. It’s a freewheel and has an inverted fork crown and plunger front brake, another indicator of an early 20th century machine. It also has early style French wooden handlebar grips, and early pattern mudguards without a forward extension. 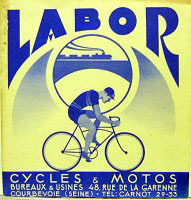 The 1906 Labor catalogue illustrates a different style of head badge. So either it’s post-1906 or this more common style of Labor badge is a later addition. 26″ wheel bicycles were rare in Britain and America pre-WW1, but they were definitely used in France, particularly for racing and sporting machines. So I’ve described it as a ‘road racer.’ Whatever its precise age, this is a distinctive rare early lightweight machine and it’s ready to ride.